Two Wits Economic Freedom Front (EFF) leaders were detained by police after occupying offices at the Department of Higher Education in Pretoria on Thursday. 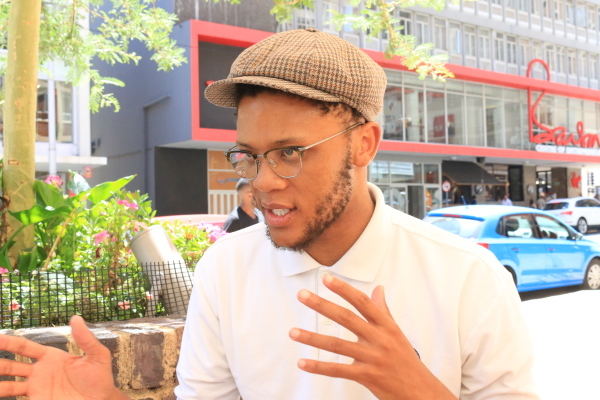 LOCKED UP: Wits EFF chairperson Vuyani Pambo talks freedom and education following his detainment at the Department of Higher Education yesterday. Photo: Tendai Dube. On Thursday morning 17 EFF members travelled by train from Johannesburg to the Higher Education Department in Pretoria to address student concerns over the lack of funding by the National Student Financial Aid Scheme (NSFAS). Almost 3 000 Wits students who had been promised funding by the scheme have been left unable to register for studies this year. Shortly after their arrival at the Pretoria offices the protesters sought a meeting with senior officials at the department, but were asked to move off the premises by a South African Police Service (SAPS) special crowd control unit, who later escorted the two student leaders to the station. While they were detained, no official arrests were made. “The department says it is unable to secure funds because it doesn’t have funding from the government,” said Wits EFF member Sive Mqikela who was present at the protest. Mngixtama believes the solution to South Africa’s education crisis is to remove the bursary system and implement a free education for poor students. Both Pambo and Mbhele have since been released without charges laid against them. Wits Vuvuzela: Wits Management and SRC reach agreement on NSFAS, January 23 2015. Wits Vuvuzela: PYA gives Wits NSFAS ultimatum, February 5 2015. Wits Vuvuzela: Wits students protest NSFAS application complication, Januray 21 2015.